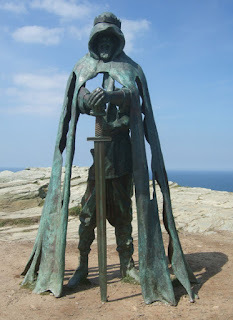 Back when I was young, people were scornful about the idea that Tintagel had any connection with King Arthur except in fiction. We were taught that the remains of buildings there were just an early monastery. 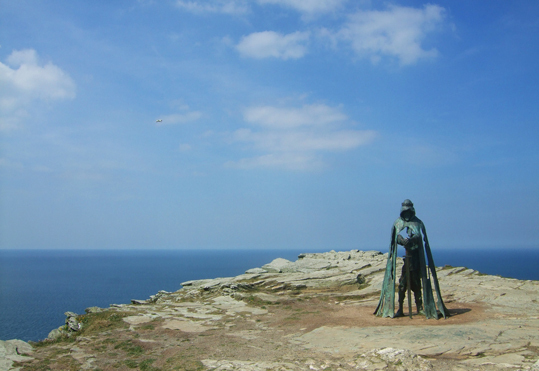 Then, in the 1990s, archaeologists discovered that Tintagel had actually once been a royal castle - and everything was turned on its head. Now English Heritage, which manages the site, is fully embracing the Arthurian legends with an exhibition, plaques around the old walled garden telling part of the tale of Tristan and Iseult, and an 8ft tall bronze statue of King Arthur on the edge of the cliff - which you can see in these photos that I took when I visited the other day. I was lucky enough to go on a day when the sun was shining and there were remarkably few other tourists at the site. Every time I've been in the past it was packed with visitors, but this time my hubby and I could enjoy the views and explore the ruins pretty much undisturbed.